Grants your wish and adds lots of Genie emojis! The Genie populates more genies, which in turn may create additional powerups. For a short time, each match adds +1 second to the clock! After activating White Rabbit’s power, make matches or use powerups quickly. Flies across on the Magic Carpet and clears emojis! Jasmine and Prince Ali Ababwa ride Magic Carpet across the sky, clearing emojis along the top of the board. Hit the target for a bigger smile that clears the board. As the wheel spins, line up the dot in the circle. Touch the screen to stop the spinning. Tap the board to make a giant Alice appear! Touch a spot to clear 9 emojis. Make a wish! 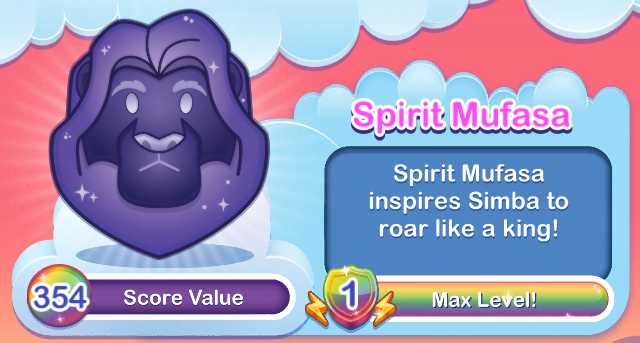 Rub the magic lamp to get prizes! Quickly slide your finger across the lamp to fill the power meter. You may receive new powerup, coins, or extra time. Tap an Abu emoji to clear an adjacent emoji to replace it with a powerup! Touch Abu and a powerup will appear next to it. Unlock your silver box characters as quickly as you can. They cost less coins to buy, and build to full power (level 3) faster than gold box characters. 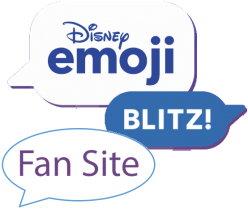 Silver box emojis ﻿Randall and Flounder will be very helpful to you at full power level! Distribution: Exclusive Unlock from The Lion King Group Collection. Maximum Level 1. Spirit Mufasa inspires Simba to roar like a king! Mufasa’s power causes Simba characters to duplicate, often creating combinations that clear emojis or create new powerups. Pixie dust creates random powerups on the board. Just a little bit of pixie dust, and we’re on our way! Tinker Bell adds new powerups to the board.